Nahuatl (English: /ˈnɑːwɑːtəl/; Nahuatl pronunciation: [ˈnaːwatɬ] ( listen)),[cn 1] known historically as Aztec, is a language or group of languages of the Uto-Aztecan language family. Varieties of Nahuatl are spoken by about 1.7 million Nahua peoples, most of whom live in central Mexico. Nahuatl has been spoken in central Mexico since at least the seventh century CE. It was the language of the Aztecs, who dominated what is now central Mexico during the Late Postclassic period of Mesoamerican history. During the centuries preceding the Spanish conquest of the Aztec Empire, the Aztecs had expanded to incorporate a large part of central Mexico, and their influence caused the variety of Nahuatl spoken by the residents of Tenochtitlan to become a prestige language in Mesoamerica. At the conquest, with the introduction of the Latin alphabet, Nahuatl also became a literary language, and many chronicles, grammars, works of poetry, administrative documents and codices were written in it during the 16th and 17th centuries. This early literary language based on the Tenochtitlan variety has been labeled Classical Nahuatl, and is among the most studied and best-documented languages of the Americas. Nahuan languages exhibit a complex morphology characterized by polysynthesis and agglutination. Through a very long period of coexistence with the other indigenous Mesoamerican languages, they have absorbed many influences, coming to form part of the Mesoamerican language area. Many words from Nahuatl have been borrowed into Spanish and, from there, were diffused into hundreds of other languages. Most of these loanwords denote things indigenous to central Mexico which the Spanish heard mentioned for the first time by their Nahuatl names. English words of Nahuatl origin include "avocado", "chayote", "chili", "chocolate", "atlatl", "coyote", "peyote", "axolotl" and "tomato". As a language label, the term "Nahuatl" encompasses a group of closely related languages or divergent dialects within the Nahuan branch of the Uto-Aztecan language family. The Mexican Instituto Nacional de Lenguas Indígenas (National Institute of Indigenous Languages) recognizes 30 individual varieties within the "language group" labeled Nahuatl. The Ethnologue recognizes 28 varieties with separate ISO codes. Sometimes the label also is used to include the Pipil language (Nawat) of El Salvador. Regardless of whether "Nahuatl" is considered to label a dialect continuum or a group of separate languages, the varieties form a single branch within the Uto-Aztecan family, descended from a single Proto-Nahuan language. Within Mexico, the question of whether to consider individual varieties to be languages or dialects of a single language is highly political. This article focuses on describing the general history of the group and on giving an overview of the diversity it encompasses. For details on individual varieties or subgroups, see the individual articles. In the past, the branch of Uto-Aztecan to which Nahuatl belongs has been called "Aztecan". From the 1990s onward, the alternative designation "Nahuan" has been frequently used as a replacement, especially in Spanish-language publications. The Nahuan (Aztecan) branch of Uto-Aztecan is widely accepted as having two divisions: "General Aztec" and Pochutec. General Aztec encompasses the Nahuatl and Pipil languages. [cn 3] Pochutec is a scantily attested language, which became extinct in the 20th century, and which Campbell and Langacker classify as being outside of general Aztec. Other researchers have argued that Pochutec should be considered a divergent variant of the western periphery. "Nahuatl" denotes at least Classical Nahuatl together with related modern languages spoken in Mexico. The inclusion of Pipil into the group is debated. Lyle Campbell (1997) classified Pipil as separate from the Nahuatl branch within general Aztecan, whereas dialectologists like Una Canger, Karen Dakin, Yolanda Lastra and Terrence Kaufman have preferred to include Pipil within the General Aztecan branch, citing close historical ties with the eastern peripheral dialects of General Aztec. Current subclassification of Nahuatl rests on research by Canger (1980), Canger (1988) and Lastra de Suárez (1986). Canger introduced the scheme of a Central grouping and two Peripheral groups, and Lastra confirmed this notion, differing in some details. Canger & Dakin (1985) demonstrated a basic split between Eastern and Western branches of Nahuan, considered to reflect the oldest division of the proto-Nahuan speech community. Canger originally considered the central dialect area to be an innovative subarea within the Western branch, but in 2011, she suggested that it arose as an urban koiné language with features from both Western and Eastern dialect areas. Canger (1988) tentatively included dialects of La Huasteca in the Central group, while Lastra de Suárez (1986) places them in the Eastern Periphery, which was followed by Kaufman (2001). The terminology used to describe varieties of spoken Nahuatl is inconsistently applied. Many terms are used with multiple denotations, or a single dialect grouping goes under several names. Sometimes, older terms are substituted with newer ones or with the speakers' own name for their specific variety. The word Nahuatl is itself a Nahuatl word, probably derived from the word nāhuatlahtōlli [naːwat͡laʔˈtoːlli] ("clear language"). The language was formerly called "Aztec" because it was spoken by the Central Mexican peoples known as Aztecs Nahuatl pronunciation: [asˈteːkah]. During the period of the Aztec empire centered in Mexico-Tenochtitlan the language came to be identified with the politically dominant mēxihcah [meːˈʃiʔkaʔ] ethnic group, and consequently the Nahuatl language was often described as mēxihcacopa [meːʃiʔkaˈkopa] (literally "in the manner of Mexicas") or mēxihcatlahtolli "Mexica language". Now, the term "Aztec" is rarely used for modern Nahuan languages, but linguists' traditional name of "Aztecan" for the branch of Uto-Aztecan that comprises Nahuatl, Pipil, and Pochutec is still in use (although some linguists prefer "Nahuan"). Since 1978, the term "General Aztec" has been adopted by linguists to refer to the languages of the Aztecan branch excluding the Pochutec language. The speakers of Nahuatl themselves often refer to their language as either Mexicano or some word derived from mācēhualli, the Nahuatl word for "commoner". One example of the latter is the case for Nahuatl spoken in Tetelcingo, whose speakers call their language mösiehuali. The Pipil people of El Salvador do not call their own language "Pipil", as most linguists do, but rather nawat. The Nahuas of Durango call their language Mexicanero. Speakers of Nahuatl of the Isthmus of Tehuantepec call their language mela'tajtol ("the straight language"). Some speech communities use "Nahuatl" as the name for their language although it seems to be a recent innovation. Linguists commonly identify localized dialects of Nahuatl by adding as a qualifier the name of the village or area where that variety is spoken. On the issue of geographic origin, the consensus of linguists during the 20th century was that the Uto-Aztecan language family originated in the southwestern United States. Evidence from archaeology and ethnohistory supports the thesis of a southward diffusion across the American continent, specifically that speakers of early Nahuan languages migrated from Aridoamerica into central Mexico in several waves. But recently, the traditional assessment has been challenged by Jane H. Hill, who proposes instead that the Uto-Aztecan language family originated in central Mexico and spread northwards at a very early date. This hypothesis and the analyses of data that it rests upon have received serious criticism. The proposed migration of speakers of the Proto-Nahuan language into the Mesoamerican region has been placed at sometime around AD 500, towards the end of the Early Classic period in Mesoamerican chronology. Before reaching the Mexican Plateau, pre-Nahuan groups probably spent a period of time in contact with the Corachol languages Cora and Huichol of northwestern Mexico (which are also Uto-Aztecan). The major political and cultural center of Mesoamerica in the Early Classic period was Teotihuacan. The identity of the language(s) spoken by Teotihuacan's founders has long been debated, with the relationship of Nahuatl to Teotihuacan being prominent in that enquiry. While in the 19th and early 20th centuries it was presumed that Teotihuacan had been founded by speakers of Nahuatl, later linguistic and archaeological research tended to disconfirm this view. Instead, the timing of the Nahuatl influx was seen to coincide more closely with Teotihuacan's fall than its rise, and other candidates such as Totonacan identified as more likely. But recently, evidence from Mayan epigraphy of possible Nahuatl loanwords in Mayan languages has been interpreted as demonstrating that other Mesoamerican languages may have been borrowing words from Proto-Nahuan (or its early descendants) significantly earlier than previously thought, bolstering the possibility of a significant Nahuatl presence at Teotihuacan. In Mesoamerica the Mayan, Oto-Manguean and Mixe–Zoque languages had coexisted for millennia. This had given rise to the Mesoamerican language area ("language area" refers to a set of language traits have become common among the area's languages by diffusion and not by evolution within a set of languages belonging to a common genetic subgrouping). After the Nahuas migrated into the Mesoamerican cultural zone, their language too adopted some of the traits defining the Mesoamerican Linguistic Area. Examples of such adopted traits are the use of relational nouns, the appearance of calques, or loan translations, and a form of possessive construction typical of Mesoamerican languages. A language which was the ancestor of Pochutec split from Proto-Nahuan (or Proto-Aztecan) possibly as early as AD 400, arriving in Mesoamerica a few centuries earlier than the main bulk of speakers of Nahuan languages. Some Nahuan groups migrated south along the Central American isthmus, reaching as far as Nicaragua. The critically endangered Pipil language of El Salvador is the only living descendant of the variety of Nahuatl once spoken south of present-day Mexico. Beginning in the 7th century, Nahuan speakers rose to power in central Mexico. The people of the Toltec culture of Tula, which was active in central Mexico around the 10th century, are thought to have been Nahuatl speakers. By the 11th century, Nahuatl speakers were dominant in the Valley of Mexico and far beyond, with settlements including Azcapotzalco, Colhuacan and Cholula rising to prominence. Nahua migrations into the region from the north continued into the Postclassic period. One of the last of these migrations to arrive in the Valley of Mexico settled on an island in the Lake Texcoco and proceeded to subjugate the surrounding tribes. This group was the Mexica, who over the course of the next three centuries founded an empire named Tenochtitlan. Their political and linguistic influence came to extend into Central America and Nahuatl became a lingua franca among merchants and elites in Mesoamerica, e.g., among the Maya K'iche' people. As Tenochtitlan grew to become the largest urban center in Central America and one of the largest in the world at the time, it attracted speakers of Nahuatl from diverse areas giving birth to an urban form of Nahuatl with traits from many dialects. This urbanized variety of Tenochtitlan is what came to be known as Classical Nahuatl as documented in colonial times. With the arrival of the Spanish in 1519, Nahuatl was displaced as the dominant regional language, but remained important in Nahua communities under Spanish rule. There is extensive colonial-era documentation in Nahuatl for Tlaxcala, Cuernavaca, Culhuacan, Coyoacan, Toluca and other locations in the Valley of Mexico and beyond. Starting in the 1970s, scholars of Mesoamerican ethnohistory have analyzed local-level texts in Nahuatl and other indigenous languages to gain insight into cultural change in the colonial era via linguistic changes, known at present as the New Philology. A number of these texts have been translated and published in part or in their entirety. The types of documentation include censuses, especially a very early set from the Cuernavaca region, town council records from Tlaxcala, and testaments of individual Nahuas. Since the Spanish made alliances with first the Nahuatl speakers from Tlaxcala and later with the conquered Mexica of Tenochtitlan (Aztecs), the Nahuatl continued spreading throughout Mesoamerica in the decades after the conquest. Spanish expeditions with thousands of Nahua soldiers marched north and south to conquer new territories. Society of Jesus missions in northern Mexico and the Southwestern United States often included a barrio of Tlaxcaltec soldiers who remained to guard the mission. For example, some fourteen years after the northeastern city of Saltillo was founded in 1577, a Tlaxcaltec community was resettled in a separate nearby village, San Esteban de Nueva Tlaxcala, to cultivate the land and aid colonization efforts that had stalled in the face of local hostility to the Spanish settlement. As for the conquest of modern-day Central America, Pedro de Alvarado conquered Guatemala with the help of tens of thousands of Tlaxcaltec allies, who then settled outside of modern-day Antigua Guatemala. Page 51 of Book IX from the Florentine Codex. The text is in Nahuatl written in the Latin alphabet. As a part of their missionary efforts, members of various religious orders (principally Franciscan and Dominican friars and Jesuits) introduced the Latin alphabet to the Nahuas. Within the first twenty years after the Spanish arrival, texts were being prepared in the Nahuatl language written in Latin characters. Simultaneously, schools were founded, such as the Colegio de Santa Cruz de Tlatelolco in 1536, which taught both indigenous and classical European languages to both Native Americans and priests. Missionary grammarians undertook the writing of grammars, also called artes, of indigenous languages for use by priests. The first Nahuatl grammar, written by Andrés de Olmos, was published in 1547—three years before the first French grammar. By 1645, four more had been published, authored respectively by Alonso de Molina (1571), Antonio del Rincón (1595), Diego de Galdo Guzmán (1642), and Horacio Carochi (1645). Carochi's is today considered the most important of the colonial era grammars of Nahuatl. Carochi has been particularly important for scholars working in the New Philology, such that there is a 2001 English translation of Carochi's 1645 grammar by James Lockhart. Through contact with Spanish the Nahuatl language adopted many loan words, and as bilingualism intensified, changes in the grammatical structure of Nahuatl followed. In 1570, King Philip II of Spain decreed that Nahuatl should become the official language of the colonies of New Spain in order to facilitate communication between the Spanish and natives of the colonies. This led to Spanish missionaries teaching Nahuatl to Indians living as far south as Honduras and El Salvador. During the 16th and 17th centuries, Classical Nahuatl was used as a literary language, and a large corpus of texts from that period exists today. They include histories, chronicles, poetry, theatrical works, Christian canonical works, ethnographic descriptions, and administrative documents. The Spanish permitted a great deal of autonomy in the local administration of indigenous towns during this period, and in many Nahuatl-speaking towns the language was the de facto administrative language both in writing and speech. 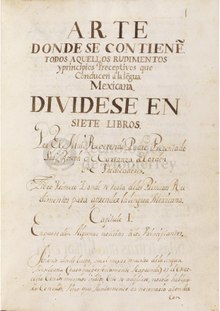 A large body of Nahuatl literature was composed during this period, including the Florentine Codex, a twelve-volume compendium of Aztec culture compiled by Franciscan Bernardino de Sahagún; Crónica Mexicayotl, a chronicle of the royal lineage of Tenochtitlan by Fernando Alvarado Tezozómoc; Cantares Mexicanos, a collection of songs in Nahuatl; a Nahuatl-Spanish/Spanish-Nahuatl dictionary compiled by Alonso de Molina; and the Huei tlamahuiçoltica, a description in Nahuatl of the apparition of Our Lady of Guadalupe. Grammars and dictionaries of indigenous languages were composed throughout the colonial period, but their quality was highest in the initial period. The friars found that learning all the indigenous languages was impossible in practice, so they concentrated on Nahuatl. For a time, the linguistic situation in Mesoamerica remained relatively stable, but in 1696, Charles II of Spain issued a decree banning the use of any language other than Spanish throughout the Spanish Empire. In 1770, another decree, calling for the elimination of the indigenous languages, did away with Classical Nahuatl as a literary language. Until Mexican Independence in 1821, the Spanish courts admitted Nahuatl testimony and documentation as evidence in lawsuits, with court translators rendering it in Spanish. Throughout the modern period the situation of indigenous languages has grown increasingly precarious in Mexico, and the numbers of speakers of virtually all indigenous languages have dwindled. Although the absolute number of Nahuatl speakers has actually risen over the past century, indigenous populations have become increasingly marginalized in Mexican society. In 1895, Nahuatl was spoken by over 5% of the population. By 2000, this proportion had fallen to 1.49%. Given the process of marginalization combined with the trend of migration to urban areas and to the United States, some linguists are warning of impending language death. At present Nahuatl is mostly spoken in rural areas by an impoverished class of indigenous subsistence agriculturists. According to the Mexican national statistics institute, INEGI, 51% of Nahuatl speakers are involved in the farming sector and 6 in 10 receive no wages or less than the minimum wage. From the early 20th century to at least the mid-1980s, educational policies in Mexico focused on the hispanicization (castellanización) of indigenous communities, teaching only Spanish and discouraging the use of indigenous languages. As a result, today there is no group of Nahuatl speakers having attained general literacy in Nahuatl; while their literacy rate in Spanish also remains much lower than the national average. Even so, Nahuatl is still spoken by well over a million people, of whom around 10% are monolingual. The survival of Nahuatl as a whole is not imminently endangered, but the survival of certain dialects is, and some dialects have already become extinct within the last few decades of the 20th century. The 1990s saw the onset of a radical change in official Mexican government policies towards indigenous and linguistic rights. Developments of accords in the international rights arena[cn 4] combined with domestic pressures (such as social and political agitation by the Zapatista Army of National Liberation and indigenous social movements) led to legislative reforms and the creation of decentralized government agencies like the National Commission for the Development of Indigenous Peoples (CDI) and the Instituto Nacional de Lenguas Indígenas (INALI) with responsibilities for the promotion and protection of indigenous communities and languages. In particular, the federal Ley General de Derechos Lingüísticos de los Pueblos Indígenas ["General Law on the Language Rights of the Indigenous Peoples", promulgated 13 March 2003] recognizes all the country's indigenous languages, including Nahuatl, as "national languages" and gives indigenous people the right to use them in all spheres of public and private life. In Article 11, it grants access to compulsory, bilingual and intercultural education. Nonetheless, progress towards institutionalizing Nahuatl and securing linguistic rights for its speakers has been slow. Today, a spectrum of Nahuan languages are spoken in scattered areas stretching from the northern state of Durango to Tabasco in the southeast. Pipil, the southernmost Nahuan language, is spoken in El Salvador by a small number of speakers. According to IRIN-International, the Nawat Language Recovery Initiative project, there are no reliable figures for the contemporary numbers of speakers of Pipil. Numbers may range anywhere from "perhaps a few hundred people, perhaps only a few dozen". According to the 2000 census by INEGI, Nahuatl is spoken by an estimated 1.45 million people, some 198,000 (14.9%) of whom are monolingual. There are many more female than male monolinguals, and women represent nearly two thirds of the total number. The states of Guerrero and Hidalgo have the highest rates of monolingual Nahuatl speakers relative to the total Nahuatl speaking population, at 24.2% and 22.6%, respectively. For most other states the percentage of monolinguals among the speakers is less than 5%. This means that in most states more than 95% of the Nahuatl speaking population are bilingual in Spanish. The largest concentrations of Nahuatl speakers are found in the states of Puebla, Veracruz, Hidalgo, San Luis Potosí, and Guerrero. Significant populations are also found in the State of Mexico, Morelos, and the Federal District, with smaller communities in Michoacán and Durango. Nahuatl became extinct in the states of Jalisco and Colima during the 20th century. As a result of internal migration within the country, Nahuatl speaking communities exist in all states in Mexico. The modern influx of Mexican workers and families into the United States has resulted in the establishment of a few small Nahuatl speaking communities in that country, particularly in California, New York, Texas, New Mexico and Arizona. Nahuan languages are defined as a subgroup of Uto-Aztecan by having undergone a number of shared changes from the Uto-Aztecan protolanguage (PUA). The table below shows the phonemic inventory of Classical Nahuatl as an example of a typical Nahuan language. In some dialects, the /t͡ɬ/ phoneme, so common in Classical Nahuatl, has changed into either /t/, as in Isthmus Nahuatl, Mexicanero and Pipil, or into /l/, as in Nahuatl of Pómaro, Michoacán. Many dialects no longer distinguish between short and long vowels. Some have introduced completely new vowel qualities to compensate, as is the case for Tetelcingo Nahuatl. Others have developed a pitch accent, such as Nahuatl of Oapan, Guerrero. Many modern dialects have also borrowed phonemes from Spanish, such as /b, d, ɡ, f/. * The glottal phoneme, called the "saltillo", occurs only after vowels. In many modern dialects it is realized as an [h], but in others, as in Classical Nahuatl, it is a glottal stop [ʔ]. Most varieties have relatively simple patterns of sound alternation (allophony). In many dialects, the voiced consonants are devoiced in word-final position and in consonant clusters: /j/ devoices to a voiceless palato-alveolar sibilant /ʃ/, /w/ devoices to a voiceless glottal fricative [h] or to a voiceless labialized velar approximant [ʍ], and /l/ devoices to voiceless alveolar lateral fricative [ɬ]. In some dialects, the first consonant in almost any consonant cluster becomes [h]. Some dialects have productive lenition of voiceless consonants into their voiced counterparts between vowels. The nasals are normally assimilated to the place of articulation of a following consonant. The voiceless alveolar lateral affricate [t͡ɬ] is assimilated after /l/ and pronounced [l]. Most Nahuatl dialects have stress on the penultimate syllable of a word. In Mexicanero from Durango, many unstressed syllables have disappeared from words, and the placement of syllable stress has become phonemic. For details, see Classical Nahuatl grammar. The Nahuatl languages are agglutinative, polysynthetic languages that make extensive use of compounding, incorporation and derivation. That is, they can add many different prefixes and suffixes to a root until very long words are formed, and a single word can constitute an entire sentence. The Nahuatl noun has a relatively complex structure. The only obligatory inflections are for number (singular and plural) and possession (whether the noun is possessed, as is indicated by a prefix meaning 'my', 'your', etc.). Nahuatl has neither case nor gender, but Classical Nahuatl and some modern dialects distinguish between animate and inanimate nouns. In Classical Nahuatl the animacy distinction manifested with respect to pluralization, as only animate nouns could take a plural form, and all inanimate nouns were uncountable (as the words "bread" and "money" are uncountable in English). Now, many speakers do not maintain this distinction and all nouns may take the plural inflection. One dialect, that of the Eastern Huasteca, has a distinction between two different plural suffixes for animate and inanimate nouns. In most varieties of Nahuatl, nouns in the unpossessed singular form generally take an "absolutive" suffix. The most common forms of the absolutive are -tl after vowels, -tli after consonants other than l, and -li after l. Nouns that take the plural usually form the plural by adding one of the plural absolutive suffixes -tin or -meh, but some plural forms are irregular or formed by reduplication. Some nouns have competing plural forms. Nahuatl distinguishes between possessed and unpossessed forms of nouns. The absolutive suffix is not used on possessed nouns. In all dialects, possessed nouns take a prefix agreeing with number and person of its possessor. Possessed plural nouns take the ending -/waːn/. Nahuatl does not have grammatical case but uses what is sometimes called a relational noun to describe spatial (and other) relations. These morphemes cannot appear alone but must occur after a noun or a possessive prefix. They are also often called postpositions or locative suffixes. In some ways these locative constructions resemble and can be thought of as locative case constructions. Most modern dialects have incorporated prepositions from Spanish that are competing with or that have completely replaced relational nouns. Noun compounds are commonly formed by combining two or more nominal stems or combining a nominal stem with an adjectival or verbal stem. Much more common is an honorific/non-honorific distinction, usually applied to second and third persons but not first. The Nahuatl verb is quite complex and inflects for many grammatical categories. The verb is composed of a root, prefixes, and suffixes. The prefixes indicate the person of the subject, and person and number of the object and indirect object, whereas the suffixes indicate tense, aspect, mood and subject number. Most Nahuatl dialects distinguish three tenses: present, past, and future, and two aspects: perfective and imperfective. Some varieties add progressive or habitual aspects. Many dialects distinguish at least the indicative and imperative moods, and some also have optative and vetative/prohibitive moods. Most Nahuatl varieties have a number of ways to alter the valency of a verb. Classical Nahuatl had a passive voice (also sometimes defined as an impersonal voice), but this is not found in most modern varieties. However the applicative and causative voices are found in many modern dialects. Many Nahuatl varieties also allow forming verbal compounds with two or more verbal roots. Some Nahuatl varieties, notably Classical Nahuatl, can inflect the verb to show the direction of the verbal action going away from or towards the speaker. Some also have specific inflectional categories showing purpose and direction and such complex notions as "to go in order to" or "to come in order to", "go, do and return", "do while going", "do while coming", "do upon arrival", or "go around doing". Classical Nahuatl and many modern dialects have grammaticalised ways to express politeness towards addressees or even towards people or things that are being mentioned, by using special verb forms and special "honorific suffixes". /we:-wetsi/ "he/she falls several times"
/weʔ-wetsi-ʔ/ "they fall (many people)"
Some linguists have argued that Nahuatl displays the properties of a non-configurational language, meaning that word order in Nahuatl is basically free. Nahuatl allows all possible orderings of the three basic sentence constituents. It is prolifically a pro-drop language: it allows sentences with omission of all noun phrases or independent pronouns, not just of noun phrases or pronouns whose function is the sentence subject. In most varieties independent pronouns are used only for emphasis. It allows certain kinds of syntactically discontinuous expressions. Michel Launey argues that Classical Nahuatl had a verb-initial basic word order with extensive freedom for variation, which was then used to encode pragmatic functions such as focus and topicality. The same has been argued for some contemporary varieties. It has been argued that Classical Nahuatl syntax is best characterised by "omnipredicativity", meaning that any noun or verb in the language is in fact a full predicative sentence. A radical interpretation of Nahuatl syntactic typology, this nonetheless seems to account for some of the language's peculiarities, for example, why nouns must also carry the same agreement prefixes as verbs, and why predicates do not require any noun phrases to function as their arguments. For example, the verbal form tzahtzi means "he/she/it shouts", and with the second person prefix titzahtzi it means "you shout". Nouns are inflected in the same way: the noun "conētl" means not just "child", but also "it is a child", and ticonētl means "you are a child". This prompts the omnipredicative interpretation, which posits that all nouns are also predicates. According to this interpretation a phrase such as tzahtzi in conētl should not be interpreted as meaning just "the child screams" but, rather, "it screams, (the one that) is a child". Nearly 500 years of intense contact between speakers of Nahuatl and speakers of Spanish, combined with the minority status of Nahuatl and the higher prestige associated with Spanish has caused many changes in modern Nahuatl varieties, with large numbers of words borrowed from Spanish into Nahuatl, and the introduction of new syntactic constructions and grammatical categories. In this example from Mexicanero Nahuat, of Durango, the original postposition/relational noun -pin "in/on" is used as a preposition. Also, "porque", a conjunction borrowed from Spanish, occurs in the sentence. Many dialects have also undergone a degree of simplification of their morphology that has caused some scholars to consider them to have ceased to be polysynthetic. 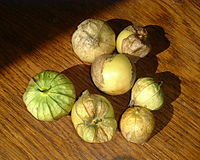 The Aztecs called (red) tomatoes xitōmatl, whereas the green tomatillo was called tōmatl; the latter is the source for the English word "tomato". Many Nahuatl words have been borrowed into the Spanish language, most of which are terms designating things indigenous to the American continent. Some of these loans are restricted to Mexican or Central American Spanish, but others have entered all the varieties of Spanish in the world. A number of them, such as "chocolate", "tomato" and "avocado" have made their way into many other languages via Spanish. Traditionally, Pre-Columbian Aztec writing has not been considered a true writing system, since it did not represent the full vocabulary of a spoken language in the way that the writing systems of the Old World or the Maya Script did. Therefore, generally Aztec writing was not meant to be read, but to be told. The elaborate codices were essentially pictographic aids for memorizing texts, which include genealogies, astronomical information, and tribute lists. Three kinds of signs were used in the system: pictures used as mnemonics (which do not represent particular words), logograms which represent whole words (instead of phonemes or syllables), and logograms used only for their sound values (i.e. used according to the rebus principle). However, epigrapher Alfonso Lacadena has argued that by the eve of the Spanish invasion, one school of Nahua scribes, those of Tetzcoco, had developed a fully syllabic script which could represent spoken language phonetically in the same way that the Maya script did. Some other epigraphers have questioned the claim, arguing that although the syllabicity was clearly extant in some early colonial manuscripts (hardly any pre-Columbian manuscripts have survived), this could be interpreted as a local innovation inspired by Spanish literacy rather than a continuation of a pre-Columbian practice. The Spanish introduced the Latin script, which was used to record a large body of Aztec prose, poetry and mundane documentation such as testaments, administrative documents, legal letters, etc. In a matter of decades pictorial writing was completely replaced with the Latin alphabet. No standardized Latin orthography has been developed for Nahuatl, and no general consensus has arisen for the representation of many sounds in Nahuatl that are lacking in Spanish, such as long vowels and the glottal stop. The orthography most accurately representing the phonemes of Nahuatl was developed in the 17th century by the Jesuit Horacio Carochi, building on the insights of another Jesuit, Antonio del Rincon. Carochi's orthography used two different diacritics: a macron to represent long vowels and a grave for the saltillo, and sometimes an acute accent for short vowels. This orthography did not achieve a wide following outside of the Jesuit community. whether to follow Spanish orthographic practice and write /k/ with c and qu, /kʷ/ with cu and uc, /s/ with c and z, or s, and /w/ with hu and uh, or u.
how to write the "saltillo" phoneme (in some dialects pronounced as a glottal stop [ʔ] and in others as an [h]), which has been spelled with j, h, ' (apostrophe), or a grave accent on the preceding vowel, but which traditionally has often been omitted in writing. whether and how to represent vowel length, e.g. by double vowels or by the use of macrons. Among the indigenous languages of the Americas, the extensive corpus of surviving literature in Nahuatl dating as far back as the 16th century may be considered unique. Nahuatl literature encompasses a diverse array of genres and styles, the documents themselves composed under many different circumstances. It appears that the preconquest Nahua had a distinction much like the European distinction between "prose" and "poetry", the first called tlahtolli "speech" and the second cuicatl "song". Nahuatl tlahtolli prose has been preserved in different forms. Annals and chronicles recount history, normally written from the perspective of a particular altepetl (locally based polity) and often combining mythical accounts with real events. Important works in this genre include those from Chalco written by Chimalpahin, from Tlaxcala by Diego Muñoz Camargo, from Mexico-Tenochtitlan by Fernando Alvarado Tezozomoc and those of Texcoco by Fernando Alva Ixtlilxochitl. Many annals recount history year-by-year and are normally written by anonymous authors. These works are sometimes evidently based on pre-Columbian pictorial year counts that existed, such as the Cuauhtitlan annals and the Anales de Tlatelolco. Purely mythological narratives are also found, like the "Legend of the Five Suns", the Aztec creation myth recounted in Codex Chimalpopoca. This work is like a dragnet to bring to light all the words of this language with their exact and metaphorical meanings, and all their ways of speaking, and most of their practices good and evil. Nahuatl poetry is preserved in principally two sources: the Cantares Mexicanos and the Romances de los señores de Nueva España, both collections of Aztec songs written down in the 16th and 17th centuries. Some songs may have been preserved through oral tradition from pre-conquest times until the time of their writing, for example the songs attributed to the poet-king of Texcoco, Nezahualcoyotl. Karttunen & Lockhart (1980) identify more than four distinct styles of songs, e.g. the icnocuicatl ("sad song"), the xopancuicatl ("song of spring"), melahuaccuicatl ("plain song") and yaocuicatl ("song of war"), each with distinct stylistic traits. Aztec poetry makes rich use of metaphoric imagery and themes and are lamentation of the brevity of human existence, the celebration of valiant warriors who die in battle, and the appreciation of the beauty of life. "The flower, the song" – meaning "poetry"
"the tail, the wing" – meaning "the common people"
"the chest, the box" – meaning "something secret"
"the heart, the blood" – meaning "cacao"
"the drool, the spittle" – meaning "lies"
The sample text below is an excerpt from a statement issued in Nahuatl by Emiliano Zapata in 1918 in order to convince the Nahua towns in the area of Tlaxcala to join the Revolution against the regime of Venustiano Carranza. The orthography employed in the letter is improvised, and does not distinguish long vowels and only sporadically marks "saltillo" (with both ⟨h⟩ and acute accent). de netehuiloya den tlanahuatiani Arenas. ihuan quipinahtia to tlalticpac-nantzi "Mexico"
that fought under General Arenas. your good way of life. ^ The Classical Nahuatl word nāhuatl (noun stem nāhua + absolutive -tl) is thought to mean "a good, clear sound" Andrews (2003:578,364,398) This language name has several spellings, among them náhuatl (the standard spelling in the Spanish language),( "Náhuatl" (in Spanish). rae.es. Retrieved 6 July 2012. ) Naoatl, Nauatl, Nahuatl, Nawatl. In a back formation from the name of the language, the ethnic group of Nahuatl speakers are called Nahua. ^ All examples given in this section and these subsections are from Suárez (1983:61–63) unless otherwise noted. Glosses have been standardized. ^ The words pero, entender, lo-que, and en are all from Spanish. The use of the suffix -oa on a Spanish infinitive like entender, enabling the use of other Nahuatl verbal affixes, is standard. The sequence lo que tlen combines Spanish lo que 'what' with Nahuatl tlen (also meaning 'what') to mean (what else) 'what'. en is a preposition and heads a prepositional phrase; traditionally Nahuatl had postpositions or relational nouns rather than prepositions. The stem mexihka, related to the name mexihko, 'Mexico', is of Nahuatl origin, but the suffix -ano is from Spanish, and it is probable that the whole word mexicano is a re-borrowing from Spanish back into Nahuatl. ^ While there is no real doubt that the word "chocolate" comes from Nahuatl, the commonly given Nahuatl etymology /ʃokolaːtl/ "bitter water" no longer seems to be tenable. Dakin & Wichmann (2000) suggest the correct etymology to be /tʃikolaːtl/ – a word found in several modern Nahuatl dialects. ^ The Mexica used the word for the Kaqchikel capital Iximche in central Guatemala, but the word was extended to the entire zone in colonial times; see Carmack (1981:143). ^ "General Law of Linguistic Rights of Indigenous Peoples" (PDF) (in Spanish). Archived from the original (PDF) on 11 June 2008. ^ "Instituto Nacional de Lenguas Indígenas homepage". ^ a b Hammarström, Harald; Forkel, Robert; Haspelmath, Martin, eds. (2017). "Aztec". Glottolog 3.0. Jena, Germany: Max Planck Institute for the Science of Human History. ^ Canger 1980, p. 13. ^ Canger 2002, p. 195. ^ "Ley General de Derechos Lingüísticos de los Pueblos Indígenas" (PDF). Diario Oficial de la Federación (in Spanish). Issued by the Cámara de Diputados del H. Congreso de la Unión. 13 March 2003. Archived from the original (PDF) on 11 June 2008. .
^ Launey 1992, p. 116. ^ Canger 2001, p. 385. ^ Hill & Hill 1986. ^ a b Wolgemuth 2002. ^ Suárez 1983, p. 20. ^ Merrill et al. 2010. ^ Kaufman & Justeson 2009. ^ Justeson et al. 1985, p. passim. ^ Kaufman 2001, pp. 3–6,12. ^ Kaufman & Justeson 2007. ^ Kaufman 2001, pp. 6,12. ^ Carmack 1981, pp. 142–143. ^ Levy, Buddy (2008). Conquistador: Hernán Cortés, King Montezuma, and the Last Stand of the Aztecs. Bantam Books. p. 106. ISBN 978-0553384710. ^ INAFED (Instituto Nacional para el Federalismo y el Desarrollo Municipal) (2005). "Saltillo, Coahuila". Enciclopedia de los Municipios de México (in Spanish) (online version at E-Local ed.). INAFED, Secretaría de Gobernación. Archived from the original on 20 May 2007. Retrieved 28 March 2008. . The Tlaxcaltec community remained legally separate until the 19th century. ^ Canger 1980, p. 14. ^ a b Olko & Sullivan 2013. ^ Suárez 1983, pp. 140–41. ^ Suárez 1983, p. 5. ^ Rolstad 2002, p. passim..
^ INEGI 2005, pp. 63–73. ^ Suárez 1983, p. 167. ^ Suárez 1983, p. 168. ^ INEGI 2005, p. 49. ^ Pellicer, Cifuentes & Herrera 2006, pp. 132–137. ^ INALI [Instituto Nacional de Lenguas Indígenas] (n.d.). "Presentación de la Ley General de Derechos Lingüísticos". Difusión de INALI (in Spanish). INALI, Secretaría de Educación Pública. Archived from the original on 17 March 2008. Retrieved 31 March 2008. ^ INEGI 2005, p. 35. ^ Flores Farfán 2002, p. 229. ^ Sischo 1979, p. passim. ^ "Burnham, Jeff & David Tuggy (1979). A Spectrographic Analysis of Vowel Length in Rafael Delgado Nahuatl". Archived from the original on 10 August 2014. Retrieved 1 August 2014. ^ Launey 1992, p. 16. ^ Launey 1992, p. 26. ^ Launey 1992, pp. 19–22. ^ Canger 2001, p. 29. ^ Hill & Hill 1980. ^ Launey 1992, pp. 27–28. ^ Launey 1992, pp. 88–89. ^ Suárez 1977, pp. passim. ^ Launey 1999, p. passim. ^ Wolgemuth 2002, p. 35. ^ Suárez 1983, p. 61. ^ Suárez 1983, p. 81. ^ Launey 1992, pp. 207–210. ^ Suárez 1977, p. 61. ^ Launey 1992, p. 27. ^ Baker 1996, p. passim..
^ Launey 1992, pp. 36–37. ^ Launey (1994); Andrews (2003). ^ Hill & Hill 1986, p. 317. ^ Canger 2001, p. 116. ^ Hill & Hill 1986, pp. 249–340. ^ Lockhart 1992, pp. 327–329. ^ Lockhart 1992, pp. 330–335. ^ Whorf, Karttunen & Campbell 1993. ^ McDonough 2014, p. 148. ^ Bierhorst 1985, p. xii. ^ Canger 2002, p. 300. ^ León-Portilla 1985, p. 12. ^ Karttunen & Lockhart 1980. ^ Sahagún & 1950–82, pp. part I:47. ^ León-Portilla 1985, pp. 12–20. ^ Bright 1990, p. passim..
^ Bright 1990, p. 440. Amith, Jonathan D. (1989). Acento en el nahuatl de Oapan. Presentation to the Seminario de Lenguas Indígenas, Instituto de Investigaciones Filológicas-UNAM (in Spanish). México D.F. : Universidad Nacional Autónoma de México. Andrews, J. Richard (2003). Introduction to Classical Nahuatl (revised ed.). Norman: University of Oklahoma Press. ISBN 978-0-8061-3452-9. OCLC 50090230. Baker, Mark C. (1996). The Polysynthesis Parameter. Oxford Studies in Comparative Syntax. New York: Oxford University Press. ISBN 978-0-19-509308-7. OCLC 31045692. Beller, Richard; Beller, Patricia (1979). "Huasteca Nahuatl". In Ronald Langacker (ed.). Studies in Uto-Aztecan Grammar 2: Modern Aztec Grammatical Sketches. Summer Institute of Linguistics Publications in Linguistics, 56. Dallas, TX: Summer Institute of Linguistics and the University of Texas at Arlington. pp. 199–306. ISBN 978-0-88312-072-9. OCLC 6086368. Bierhorst, J. (1985). Cantares mexicanos: Songs of the Aztecs. Stanford University Press. Bierhorst, J. (1998). History and Mythology of the Aztecs: The Codex Chimalpopoca. University of Arizona Press. ISBN 978-0-8165-1886-9. Boas, Franz (1917). "El dialecto mexicano de Pochutla, Oaxaca". International Journal of American Linguistics (in Spanish). 1 (1): 9–44. doi:10.1086/463709. OCLC 56221629. Bright, William (1990). " 'With One Lip, with Two Lips': Parallelism in Nahuatl". Language. 66 (3): 437–452. doi:10.2307/414607. JSTOR 414607. OCLC 93070246. Campbell, Lyle (1985). The Pipil Language of El Salvador. Mouton Grammar Library, no. 1. Berlin: Mouton de Gruyter. ISBN 978-3-11-010344-1. OCLC 13433705. Campbell, Lyle (1997). American Indian Languages: The Historical Linguistics of Native America. Oxford Studies in Anthropological Linguistics, 4. London and New York: Oxford University Press. ISBN 978-0-19-509427-5. OCLC 32923907. Campbell, Lyle; Langacker, ronald (1978). "Proto-Aztecan vowels: Part I". International Journal of American Linguistics. 44 (2): 85–102. doi:10.1086/465526. OCLC 1753556. Canger, Una (1980). Five Studies Inspired by Náhuatl Verbs in -oa. Travaux du Cercle Linguistique de Copenhague, Vol. XIX. Copenhagen: The Linguistic Circle of Copenhagen; distributed by C.A. Reitzels Boghandel. ISBN 978-87-7421-254-6. OCLC 7276374. Canger, Una (1988). "Nahuatl dialectology: A survey and some suggestions". International Journal of American Linguistics. 54 (1): 28–72. doi:10.1086/466074. OCLC 1753556. Canger, Una (1996). "Is there a passive in nahuatl". In Engberg-Pedersen, Elisabeth; et al. (eds.). Content, expression and structure: studies in Danish functional grammar. Amsterdam: John Benjamin's Publishing Co. pp. 1–15. Canger, Una (2000). "Stress in Nahuatl of Durango: whose stress?". In Eugene H. Casad; Thomas L. Willett (eds.). Uto-Aztecan: Structural, Temporal, and Geographic Perspectives: Papers in Memory of Wick R. Miller by the Friends of Uto-Aztecan. Hermosillo, Sonora: Universidad de Sonora División de Humanidades y Bellas Artes, Editorial UniSon. pp. 373–386. ISBN 978-970-689-030-6. OCLC 50091799. Canger, Una (2001). Mexicanero de la Sierra Madre Occidental. Archivo de Lenguas Indígenas de México, #24 (in Spanish). México D.F. : El Colegio de México. ISBN 978-968-12-1041-0. OCLC 49212643. Canger, Una (2002). "An interactive dictionary and text corpus". In William Frawley; Pamela Munro; Kenneth C. Hill (eds.). Making dictionaries: Preserving Indigenous Languages of the Americas. Berkeley, CA: University of California Press. pp. 195–218. ISBN 978-0-520-22995-2. OCLC 47863283. Canger, Una (2011). "El nauatl urbano de Tlatelolco/Tenochtitlan, resultado de convergencia entre dialectos, con un esbozo brevísimo de la historia de los dialectos". Estudios de Cultura Náhuatl: 243–258. Canger, Una; Dakin, Karen (1985). "An inconspicuous basic split in Nahuatl". International Journal of American Linguistics: 358–361. Canger, Una; Jensen, Anne (2007). "Grammatical borrowing in Nahuatl". In Yaron Matras; J Sakel (eds.). Grammatical Borrowing in Cross-Linguistic Perspective Empirical Approaches to Language Typology. 38. Berlin: Mouton de Gruyter. pp. 403–418. Carmack, Robert M. (1981). The Quiché Mayas of Utatlán: The Evolution of a Highland Guatemala Kingdom. Civilization of the American Indian series, no. 155. Norman: University of Oklahoma Press. ISBN 978-0-8061-1546-7. OCLC 6555814. Carochi, Horacio (2001). Grammar of the Mexican Language: With an Explanation of Its Adverbs (1645), by Horacio Carochi. James Lockhart (trans., ed., and notes). Stanford and Los Angeles: Stanford University Press, UCLA Latin American Center Publications. ISBN 978-0-8047-4281-8. OCLC 46858462. Cline, Sarah (2000). "Native Peoples of Colonial Central Mexico". In Richard E.W. Adams; Murdo J. MacLeod (eds.). The Cambridge History of the Native Peoples of the Americas: Volume II, Mesoamerica, Part 2. New York: Cambridge University Press. pp. 187–222. Cowgill, George L. (1992). "Teotihuacan Glyphs and Imagery in the Light of Some Early Colonial Texts". In Janet Catherine Berlo (ed.). Art, Ideology, and the City of Teotihuacan: A Symposium at Dumbarton Oaks, 8th and 9th October 1988. Washington, DC: Dumbarton Oaks Research Library and Collection. pp. 231–246. ISBN 978-0-88402-205-3. OCLC 25547129. Cowgill, George L. (2003). "Teotihuacan and Early Classic Interaction: A Perspective from Outside the Maya Region". In Geoffrey E. Braswell (ed.). The Maya and Teotihuacan: Reinterpreting Early Classic Interaction. Austin: University of Texas Press. pp. 315–336. ISBN 978-0-292-70587-6. OCLC 49936017. Dakin, Karen (1982). La evolución fonológica del Protonáhuatl (in Spanish). México D.F. : Universidad Nacional Autónoma de México, Instituto de Investigaciones Filológicas. ISBN 978-968-5802-92-5. OCLC 10216962. Dakin, Karen (1994). "El náhuatl en el yutoazteca sureño: algunas isoglosas gramaticales y fonológicas". In Carolyn MacKay; Verónica Vázquez (eds.). Investigaciones lingüísticas en Mesoamérica. Estudios sobre Lenguas Americanas, no. 1 (in Spanish). México D.F. : Universidad Nacional Autónoma de México, Instituto de Investigaciones Filológicas, Seminario de Lenguas Indígenas. pp. 3–86. ISBN 978-968-36-4055-0. OCLC 34716589. Dakin, Karen; Wichmann, Søren (2000). "Cacao and Chocolate: A Uto-Aztecan Perspective" (PDF). Ancient Mesoamerica. 11 (1): 55–75. doi:10.1017/S0956536100111058. OCLC 88396015. Archived from the original (PDF online reprint) on 8 April 2008. Dakin, Karen (2001). "Estudios sobre el náhuatl". Avances y balances de lenguas yutoaztecas. Mexico: Instituto Nacional de Antropología e Historia, UNAM. ISBN 978-970-18-6966-6. Flores Farfán, José Antonio (1999). Cuatreros Somos y Toindioma Hablamos. Contactos y Conflictos entre el Náhuatl y el Español en el Sur de México (in Spanish). Tlalpán D.F. : Centro de Investigaciones y Estudios Superiores en Antropología Social. ISBN 978-968-496-344-3. OCLC 42476969. Flores Farfán, José Antonio (2002). Barbara Jane Burnaby; John Allan Reyhner (eds.). The Use of Multimedia and the Arts in Language Revitalization, Maintenance, and Development: The Case of the Balsas Nahuas of Guerrero, Mexico (PDF). Proceedings of the Annual Conference on Stabilizing Indigenous Languages (7th, Toronto, Ontario, Canada, 11–14 May 2000). Flagstaff, AZ: Center for Excellence in Education, Northern Arizona University. pp. 225–236. ISBN 978-0-9670554-2-8. OCLC 95062129. Flores Farfán, José Antonio (2006). "Intervention in indigenous education. Culturally-sensitive materials for bilingual Nahuatl speakers". In Margarita G. Hidalgo (ed.). Mexican Indigenous Languages at the Dawn of the Twenty-first Century. Contributions to the sociology of language, no. 91. Berlin: Mouton de Gruyter. pp. 301–324. ISBN 978-3-11-018597-3. OCLC 62090844. Fowler, William R. Jr. (1985). "Ethnohistoric Sources on the Pipil Nicarao: A Critical Analysis". Ethnohistory. 32 (1): 37–62. doi:10.2307/482092. JSTOR 482092. OCLC 62217753. Haugen, J. D. (2009). "Borrowed borrowings: Nahuatl loan words in English". Lexis: e-Journal in English Lexicology. 3: 63–106. Hill, J. H.; Hill, K. C. (1980). "Mixed grammar, purist grammar, and language attitudes in modern Nahuatl". Language in Society. 9 (3): 321–348. Hill, Jane H. (2001). "Proto-Uto-Aztecan: A Community of Cultivators in Central Mexico?". American Anthropologist. 103 (4): 913–934. doi:10.1525/aa.2001.103.4.913. OCLC 192932283. Hill, Jane H.; Hill, Kenneth C. (1986). Speaking Mexicano: Dynamics of Syncretic Language in Central Mexico. Tucson: University of Arizona Press. ISBN 978-0-8165-0898-3. OCLC 13126530. INALI, [Instituto Nacional de Lenguas Indígenas] (14 January 2008). "Catálogo de las lenguas indígenas nacionales: Variantes lingüísticas de México con sus autodenominaciones y referencias geoestadísticas" (PDF online facsimile). Diario Oficial de la Federación (in Spanish). 652 (9): 22–78 (first section), 1–96 (second section), 1–112 (third section). OCLC 46461036. INEGI, [Instituto Nacional de Estadísticas, Geografia e Informática] (2005). Perfil sociodemográfica de la populación hablante de náhuatl (PDF). XII Censo General de Población y Vivienda 2000 (in Spanish) (Publicación única ed.). Aguascalientes, Mex. : INEGI. ISBN 978-970-13-4491-0. Archived from the original (PDF) on 2 October 2008. Retrieved 2 December 2008. IRIN, [Iniciativa para la Recuperación del Idioma Náhuat] (2004). "IRIN-International homepage". The Nawat Language Recovery Initiative. IRIN. Archived from the original on 20 May 2010. Retrieved 31 March 2008. Jackson, Robert H. (2000). From Savages to Subjects: Missions in the History of the American Southwest. Latin American Realities hardcover series. Armonk, NY: M.E. Sharpe. ISBN 978-0-7656-0597-9. OCLC 49415084. Justeson, John S.; Norman, William M.; Campbell, Lyle; Kaufman, Terrence (1985). The Foreign Impact on Lowland Mayan Language and Script. Middle American Research Institute Publications, no. 53. New Orleans, LA: Middle American Research Institute, Tulane University. ISBN 978-0-939238-82-8. OCLC 12444550. Karttunen, Frances; Lockhart, James (1980). "La estructura de la poesía nahuatl vista por sus variantes". Estudios de Cultura Nahuatl (in Spanish). 14: 15–64. ISSN 0071-1675. OCLC 1568281. Kaufman, Terrence; Justeson, John (2009). "Historical linguistics and pre-columbian Mesoamerica". Ancient Mesoamerica. 20 (2): 221–231. doi:10.1017/S0956536109990113. Kaufman, Terrence; Justeson, John (2007). "Writing the history of the word for cacao in ancient Mesoamerica". Ancient Mesoamerica. 18 (2): 193–237. doi:10.1017/s0956536107000211. Kaufman, Terrence (2001). "The history of the Nawa language group from the earliest times to the sixteenth century: some initial results" (PDF). Revised March 2001. Project for the Documentation of the Languages of Mesoamerica. Retrieved 7 October 2007. Kimball, G. (1990). "Noun pluralization in Eastern Huasteca Nahuatl". International Journal of American Linguistics: 196–216. Knab, Tim (1980). "When Is a Language Really Dead: The Case of Pochutec". International Journal of American Linguistics. 46 (3): 230–233. doi:10.1086/465658. OCLC 1753556. Lacadena, Alfonso (2008). "Regional scribal traditions: Methodological implications for the decipherment of Nahuatl writing" (PDF). The PARI Journal. 8 (4): 1–23. Langacker, Ronald W (1977). Studies in Uto-Aztecan Grammar 1: An Overview of Uto-Aztecan Grammar. Summer Institute of Linguistics publications in linguistics, publication no. 56. Dallas: Summer Institute of Linguistics and University of Texas at Arlington. ISBN 978-0-88312-070-5. OCLC 6087919. Launey, Michel (1979). Introduction à la langue et à la littérature aztèques, vol. 1: Grammaire. Série ethnolinguistique amérindienne (in French). Paris: L'Harmattan. ISBN 978-2-85802-107-9. Launey, Michel (1992). Introducción a la lengua y a la literatura náhuatl (in Spanish). México D.F. : National Autonomous University of Mexico, Instituto de Investigaciones Antropológicas. ISBN 978-968-36-1944-0. OCLC 29376295. Launey, Michel (1994). Une grammaire omniprédicative: Essai sur la morphosyntaxe du nahuatl classique (in French). Paris: CNRS Editions. ISBN 978-2-271-05072-4. OCLC 30738298. Launey, M. (1999). "Compound nouns vs. incorporation in classical Nahuatl". STUF-Language Typology and Universals. 52 (3–4): 347–364. Launey, Michel (2011). An Introduction to Classical Nahuatl. Christopher Mackay (trans.). Cambridge: Cambridge University Press. ISBN 978-0-521-73229-1. León-Portilla, Miguel (1978). Los manifiestos en náhuatl de Emiliano Zapata (in Spanish). Cuernavaca, Mex. : Universidad Nacional Autónoma de México, Instituto de Investigaciones Antropológicas. OCLC 4977935. León-Portilla, Miguel (1985). "Nahuatl literature". In Munro S. Edmonson (Volume ed. ), with Patricia A. Andrews (ed.). Supplement to the Handbook of Middle American Indians, Vol. 3: Literatures. Victoria Reifler Bricker (General ed.). Austin: University of Texas Press. pp. 7–43. ISBN 978-0-292-77577-0. OCLC 11785568. Lockhart, James (1991). Nahuas and Spaniards: Postconquest Mexican History and Philology. UCLA Latin American studies vol. 76, Nahuatl studies series no. 3. Stanford and Los Angeles, CA: Stanford University Press and UCLA Latin American Center Publications. ISBN 978-0-8047-1953-7. OCLC 23286637. Lockhart, James (1992). The Nahuas After the Conquest: A Social and Cultural History of the Indians of Central Mexico, Sixteenth Through Eighteenth Centuries. Stanford, CA: Stanford University Press. ISBN 978-0-8047-1927-8. OCLC 24283718. Lockhart, James; Berdan, Frances F.; Anderson, Arthur J.O. (1986). The Tlaxcalan Actas: A Compendium of the Records of the Cabildo of Tlaxcala, 1545-1627. University of Utah Press. ISBN 978-0-874-80253-5. : Macri, Martha J. (2005). "Nahua loan words from the early classic period: Words for cacao preparation on a Río Azul ceramic vessel". Ancient Mesoamerica. 16 (2): 321–326. doi:10.1017/S0956536105050200. OCLC 87656385. Macri, Martha J.; Looper, Matthew G. (2003). "Nahua in ancient Mesoamerica: Evidence from Maya inscriptions". Ancient Mesoamerica. 14 (2): 285–297. doi:10.1017/S0956536103142046. OCLC 89805456. Matthew, Laura E. (2012). Memories of conquest: Becoming Mexicano in colonial Guatemala. University of North Carolina Press. McDonough, K. S. (2014). The Learned Ones: Nahua Intellectuals in Postconquest Mexico. University of Arizona Press. Merrill, W. L.; Hard, R. J.; Mabry, J. B.; Fritz, G. J.; Adams, K. R.; Roney, J. R.; Macwilliams, A. C. (2010). "Reply to Hill and Brown: Maize and Uto-Aztecan cultural history". Proceedings of the National Academy of Sciences. 107 (11): E35–E36. Bibcode:2010PNAS..107E..35M. doi:10.1073/pnas.1000923107. PMC 2841871. Olko, J.; Sullivan, J. (2013). "Empire, Colony, and Globalization. A Brief History of the Nahuatl Language". Colloquia Humanistica (2): 181–216. Pasztory, Esther (1993). "An Image Is Worth a Thousand Words: Teotihuacan and the Meanings of Style in Classic Mesoamerica". In Don Stephen Rice (ed.). Latin American horizons: a symposium at Dumbarton Oaks, 11th and 12th October 1986. Washington DC: Dumbarton Oaks Research Library and Collection, Trustees for Harvard University. pp. 113–146. ISBN 978-0-88402-207-7. OCLC 25872400. Pellicer, Dora; Cifuentes, Bábara; Herrera, Carmen (2006). "Legislating diversity in twenty-first century Mexico". In Margarita G. Hidalgo (ed.). Mexican Indigenous Languages at the Dawn of the Twenty-first Century. Contributions to the Sociology of Language, no. 91. Berlin: Mouton de Gruyter. pp. 127–168. ISBN 978-3-11-018597-3. OCLC 62090844. Peralta Ramírez, Valentin (1991). "La reduplicación en el náhuatl de Tezcoco y sus funciones sociales". Amerindia. 16: 20–36. Pharao Hansen, Magnus (2010). "Polysynthesis in Hueyapan Nahuatl: The Status of Noun Phrases, Basic Word Order, and Other Concerns" (PDF). Anthropological Linguistics. 52 (3): 274–299. doi:10.1353/anl.2010.0017. Pharao Hansen, Magnus (2013). Nahuatl in the Plural: Dialectology and Activism in Mexico. The Annual Meeting of the American Anthropological Association. Pury-Toumi, S. D. (1980). "Le saltillo en nahuatl". Amerindia. Revue d'Ethnolinguistique Amérindienne Paris. 5: 31–45. Rincón, Antonio del (1885) . Arte mexicana compuesta por el padre Antonio Del Rincón de la compañia de Jesus: Dirigido al illustrissimo y reverendissimo s. Don Diego Romano obispo de Tlaxcallan, y del consejo de su magestad, &c. En Mexico en casa de Pedro, Balli. 1595 (PDF facsimile, University of Chicago Library digital collections) (in Spanish) (Reprinted 1885 under the care of Dr. Antonio Peñafiel ed.). México D.F. : Oficina tip. de la Secretaría de fomento. OCLC 162761360. Rolstad, Kellie (2002). "Language death in Central Mexico: The decline of Spanish-Nahuatl bilingualism and the new bilingual maintenance programs". The Bilingual Review/La revista bilingüe. 26 (1): 3–18. ISSN 0094-5366. OCLC 1084374. Sahagún, Bernardino de (1950–82) [ca. 1540–85]. Florentine Codex: General History of the Things of New Spain, 13 vols. vols. I-XII. Charles E. Dibble and Arthur J.O. Anderson (eds., trans., notes and illus.) (translation of Historia General de las Cosas de la Nueva España ed.). Santa Fe, NM and Salt Lake City: School of American Research and the University of Utah Press. ISBN 978-0-87480-082-1. OCLC 276351. Sahagún, Bernardino de (1997) [ca.1558–61]. Primeros Memoriales. The Civilization of the American Indians Series vol. 200, part 2. Thelma D. Sullivan (English trans. and paleography of Nahuatl text), with H.B. Nicholson, Arthur J.O. Anderson, Charles E. Dibble, Eloise Quiñones Keber, and Wayne Ruwet (completion, revisions, and ed.). Norman: University of Oklahoma Press. ISBN 978-0-8061-2909-9. OCLC 35848992. Sischo, William R. (1979). "Michoacán Nahual". In Ronald W. Langacker (ed.). Studies in Uto-Aztecan Grammar 2: Modern Aztec Grammatical Sketches. Summer Institute of Linguistics Publications in Linguistics, no. 56. Dallas, TX: Summer Institute of Linguistics and the University of Texas at Arlington. pp. 307–380. ISBN 978-0-88312-072-9. OCLC 6086368. Smith-Stark, T. C. (2005). "Phonological description in New Spain". In Zwartjes, O.; Altman, C. (eds.). Missionary Linguistics II/Lingüística misionera II: Orthography and Phonology. Selected papers from the Second International Conference on Missionary Linguistics. 109. John Benjamins Publishing. Suárez, Jorge A. (1977). "La influencia del español en la estructura gramatical del náhuatl". Anuario de Letras. Revista de la Facultad de Filosofía y Letras (in Spanish). 15: 115–164. ISSN 0185-1373. OCLC 48341068. Suárez, Jorge A. (1983). The Mesoamerian Indian Languages. Cambridge Language Surveys. Cambridge and New York: Cambridge University Press. ISBN 978-0-521-22834-3. OCLC 8034800. Sullivan, Thelma D. (1988). Wick R. Miller; Karen Dakin (eds.). Compendium of Náhuatl Grammar. Translated by Thelma D. Sullivan & Neville Stiles (English translation of Compendio de la gramática náhuatl ed.). Salt Lake City: University of Utah Press. ISBN 978-0-87480-282-5. OCLC 17982711. Tuggy, David H. (1979). "Tetelcingo Náhuatl". In Ronald Langacker (ed.). Studies in Uto-Aztecan Grammar 2: Modern Aztec Grammatical Sketches. Summer Institute of Linguistics Publications in Linguistics, no. 56. Dallas, TX: Summer Institute of Linguistics and the University of Texas at Arlington. pp. 1–140. ISBN 978-0-88312-072-9. OCLC 6086368. Voegelin, Charles F.; Florence M. Voegelin; Kenneth L. Hale (1962). Typological and Comparative Grammar of Uto-Aztecan I: Phonology (Supplement to International Journal of American Linguistics, vol. 28, no. 1). Indiana University publications in anthropology and linguistics, Memoir 17. Baltimore MD: Waverly Press. OCLC 55576894. Whittaker, G. (2009). "The Principles of Nahuatl Writing" (PDF). Göttinger Beiträge zur Sprachwissenschaft. 16: 47–81. Whorf, Benjamin Lee; Karttunen, Frances; Campbell, Lyle (1993). "Pitch Tone and the 'Saltillo' in Modern and Ancient Nahuatl". International Journal of American Linguistics. 59 (2): 165–223. doi:10.1086/466194. OCLC 1753556. Wolgemuth, Carl (2002). Gramática Náhuatl (melaʼtájto̱l): de los municipios de Mecayapan y Tatahuicapan de Juárez, Veracruz. Sharon Stark and Albert Bickford (online eds.) (2nd ed.). México D.F. : Instituto Lingüístico de Verano. ISBN 978-968-31-0315-4. OCLC 51555383. Archived from the original (PDF online edition) on 19 April 2008. Retrieved 3 October 2007. Carochi, Horacio. Grammar of the Mexican Language: With an Explanation of its Adverbs (1645) Translated by James Lockhart. Stanford University Press. 2001. Sullivan, Thelma: Compendium of Nahuatl Grammar, Univ. of Utah Press, 1988. Launey, Michel. Introducción a la lengua y a la literatura Náhuatl. México D.F. : UNAM. 1992 (Spanish); An Introduction to Classical Nahuatl [English translation/adaptation by Christopher Mackay], 2011, Cambridge University Press. Campbell, Lyle. The Pipil Language of El Salvador, Mouton Grammar Library (No. 1). Berlin: Mouton Publishers. 1985. ISBN 0-89925-040-8. OCLC 13433705. A Catalogue of Pre-1840 Nahuatl Works Held by The Lilly Library from The Indiana University Bookman No. 11. November, 1973: 69–88. Collection of Nahuatl of the Sierra Nororiental de Puebla, Mexico of Jonathan Amith, containing recordings in Nahuatl by native speakers and transcriptions, from the Archive of Indigenous Languages of Latin America. Look up nahuatl in Wiktionary, the free dictionary. Note: The list of official languages is ordered by decreasing size of population. This page was last edited on 26 January 2019, at 15:08 (UTC).